(CNN) -- An investigation into dogfighting across five states has resulted in federal charges against 19 people, the U.S. Department of Justice announced Wednesday. More than 350 dogs were seized after an investigation into dogfighting across five states. 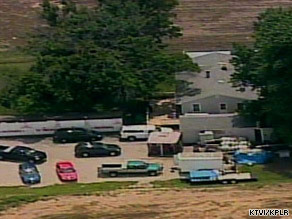 Indictments unsealed in Missouri, Illinois and Texas detailed gambling rings in which owners bred and trained dogs to fight, then killed them if the animals were badly wounded or failed to perform as desired, according to separate Justice Department statements issued in Missouri and Illinois. Some of the suspects allegedly served as referees for fights, while others were accused of being "sponge-men" who wiped off blood and cooled down dogs during matches, one of the statements said. More than 350 dogs, primarily pit bull terriers, were seized in a series of coordinated raids on various dogfighting venues, it said. The statement named seven suspects from Missouri, Nebraska and Iowa who will face a variety of charges including conspiracy, illegal gambling and bookmaking. Each of the five counts in the indictment carries a maximum sentence of five years imprisonment without parole and a maximum fine of $250,000, the statement said. "The indictment alleges that the defendants denied the dogs adequate and humane medical treatment of wounds and injuries suffered as a result of the dogfights," the statement said. "The defendants routinely and inhumanely destroyed dogs that became severely injured as a result of a fight, the indictment says, by shooting the dogs in the head, then throwing the carcasses into the river or burning them in a barrel." According to the statement, one of the accused works for a state school for the handicapped, another is a registered nurse at a Missouri community hospital and a third works for a school district. Another Justice Department statement identified five East St. Louis, Illinois, residents who were charged with one count each of conspiracy to commit unlawful activities of dogfighting. There was no further information immediately available on the other seven suspects charged in Missouri and Texas. Awareness of the prevalence of dogfighting in the United States increased in 2007 when NFL star Michael Vick, then of the Atlanta Falcons, pleaded guilty to a federal charge of bankrolling a dogfighting operation at his Virginia home. Vick was released from prison in May to serve the final two months of his 23-month sentence in home confinement.